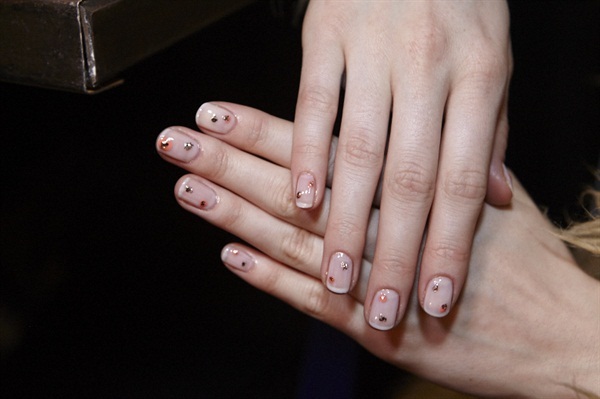 Michelle Saunders chose a glamorous, minimal take on nails for Jenny Packham’s collection. Saunders sought out a dew drop look by combining solid colors and glitter from Essie. To get the look, first apply two drops of Adore-A-Ball after the base coat has dried. Next, create dew drops by sporadically dotting Tarte Deco, followed by a smaller dot of Summit of Style on top of each nail. Then, apply a smaller dot of Summit of Style to each nail. Finish with top coat, and nails are runway-ready. At Sophie Theallet, glamorous prints and textures influenced by gypsy culture walked the runway. Julie Kandalec came up with a gypsy-inspired nail art design to tie the nails to the clothing. First, apply two coats of Essie Big Spender. Kandalec chose to do art on thumbs and one nail on each hand. Dip a striping brush in Bahama Mama and draw two thin arcs at the base of the nail. Then, dip the striper brush in Bahama Mama again and fan out five equally straight lines in the smaller arc, starting with a vertical line down the middle. To finalize, dip a dotting tool in Bahama Mama and add five equally spaced dots to the outer arc. Seal with Good to Go top coat on all nails. For a darker look, switch the colors so that Bahama Mama is the base and Big Spender is the color of the design. Keep up with Essie at NYFW by searching #EssieNYFW. For a complete rundown of runway looks, click here.